Here we’ll discuss the Magento check php download process. Before we begin with Magento it’s always better to follow some initial steps. Hence one of them is a server compatibility test for Magento. Further we need to download Magento check php file for testing server compatibility. In particular, we’ll discuss both Magento check php download and setup process. First we need to download the magento-check file. Next check download folder for Magento check php file inside your local PC. Further unzip the file using any using any software: winzip or winrar etc. Now we can see a file named magento-check.php file. Secondly we need to login to cPanel using credentials or by connecting via an ftp server. Here you can read our other article about connecting to an ftp server for example: Filezilla etc. 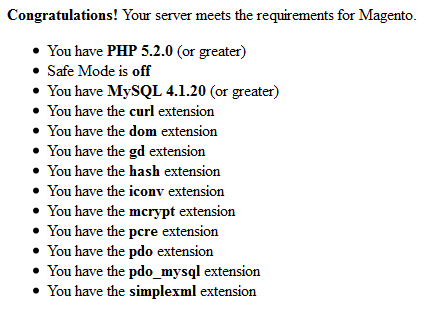 So as per your feasibility connect to the server and upload the extracted file magento-check.php. Here remember we need to upload the file inside our ROOT DIR or Mage DIR. Finally use browser to visit the following link and check the compatibility with server. As simple as that!!! So keep believe on us and enjoy optimized Mage server with Aspiration Hosting.